If it were possible to decrease the stress levels you experience in relationships by applying one principle, would you want to know what it was? What if you could increase the amount of personal power you feel in your interactions and overcome barriers between you and the significant people in your life? 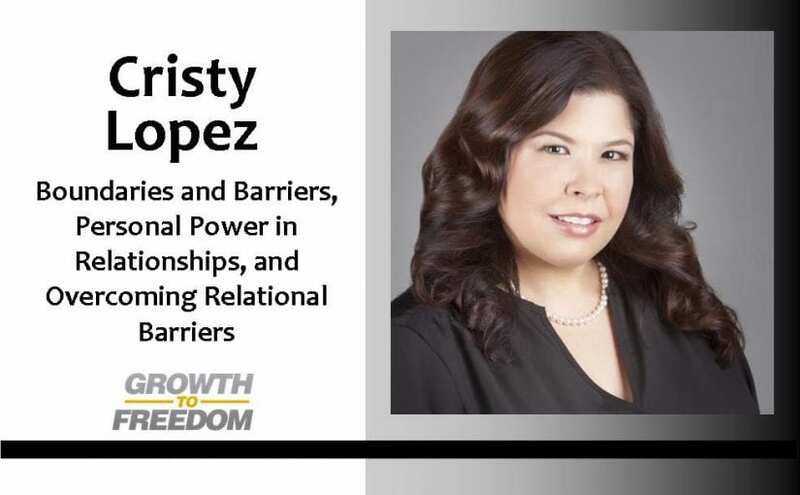 On today’s episode of Growth to Freedom I’m talking with my good friend Dr. Cristy Lopez about healthy boundaries. Cristy is a clinical psychologist who has been helping people become more successful in their own lives, relationships, and businesses for over 20 years. In Cristy’s work with individuals she often sees her clients break through barriers and limitations, eliminate unhealthy ineffective patterns of thinking and behavior, and get on the path to a more successful and healthy life. Many times those changes come through the understanding and implementation of effective personal boundaries. Are you aware of what really drives you? Or the controlling forces that dictate why you do what you do? Today you’ll get more peace of mind, confidence, and a sense of freedom from Dr. Cristy Lopez. She’s a psychologist, Coach, and has been an expert on TV shows like Dr. Phil, Downsized, and more. She helps people in transition create the life they want – in their career, business, life, and relationships. She is uniquely qualified to show you how to transform your life by mastering Emotional Mastery, Needs, and the Primary Forces that Drive Behavior – to achieve greater freedom, growth, clarity, and more.